郑斓, 李乔玄, 任红艳, 施润和, 白开旭, 鲁亮. 基于土地利用回归模型的登革热疫情与社会环境要素的空间关系研究[J]. 中国媒介生物学及控制杂志, 2018, 29(3): 226-230, 234. ZHENG Lan, LI Qiao-xuan, REN Hong-yan, SHI Run-he, BAI Kai-xu, LU Liang. Exploring the relationship between dengue fever epidemics and social-environmental factors using land use regression model[J]. Chin J Vector Biol & Control, 2018, 29(3): 226-230, 234. Corresponding author: REN Hong-yan, Email: renhy@igsnrr.ac.cn. Abstract: Objective Exploring the influence of socioeconomic factors and environmental conditions on the spatial distribution of dengue fever epidemic is an important basis for effective prevention and control of dengue fever. Methods Predictive variables, included land use data, road density and population density, were involved in modeling within different buffer zone ranges from 0.5 km to 6.0 km, which were established and verified on 150 mosquito monitoring sites. The effects of social and economic factors on the distribution of dengue fever in Guangzhou area were analyzed. Results The results found that dengue fever was significantly correlated with human population density (R2=0.567), road density (R2=0.512), farmland area (R2=0.275), forest area (R2=0.106), and village area (R2=0.041)within the buffer zones of 6, 2, 1, 1, and 2 km. The land use regression (LUR)model with these five variables possessed satisfactory capability of predicting the spatial distribution of dengue fever with the adjusted R2 (0.648)and an appropriate F value 55.944 (P < 0.01). The overall result of the model is good with the fitting accuracy between the predicted value and the measured value (0.728 8). Conclusion The socioeconomic factors have different effects on the spatial distribution of dengue fever epidemics in different ranges. LUR has good ability to predict the spatial distribution of dengue fever and provide an effective method for local public health authorities to allocate precise preventing and control measures. 李国栋, 张俊华, 焦耿军, 等. 气候变化对传染病爆发流行的影响研究进展[J]. 生态学报, 2013, 33(21): 6762-6773. 刘文华, 林立丰, 蔡松武, 等. 广东省清远市快速城市化过程中蚊虫群落动态变化规律[J]. 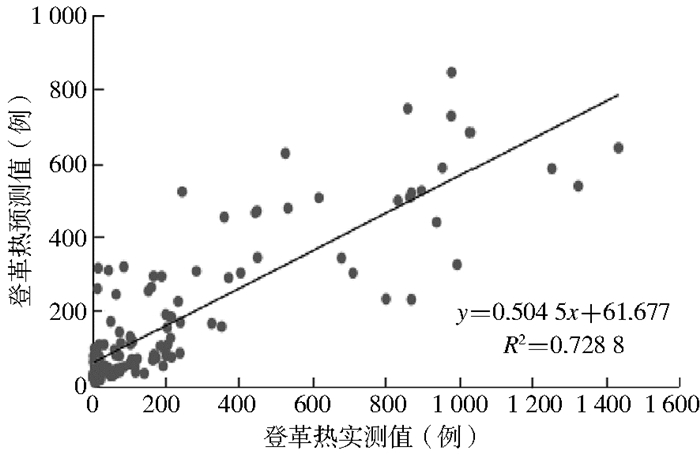 中国媒介生物学及控制杂志, 2011, 22(6): 561-563. 张浩, 王春梅, 周元平, 等. 伊蚊传播登革病毒媒介效能的研究进展[J]. 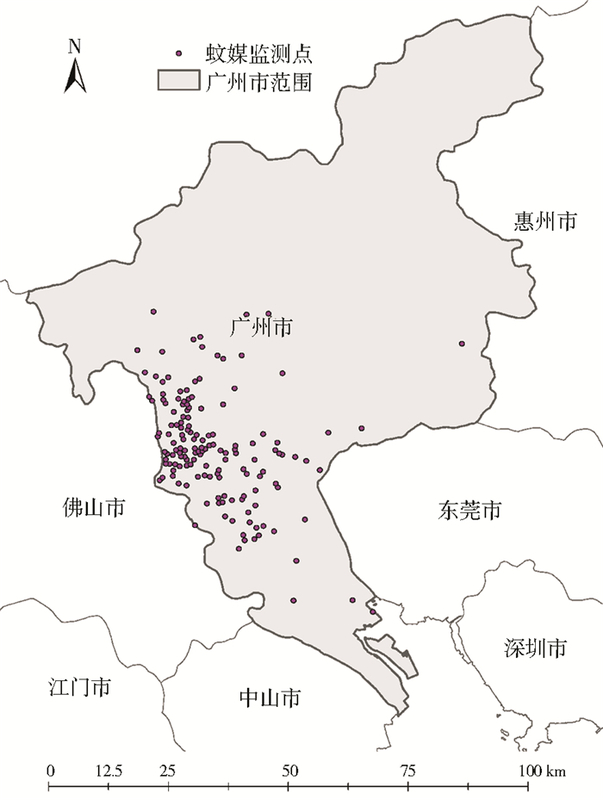 热带医学杂志, 2012, 12(9): 1160-1163, 1170. 黄俊, 蒋乐, 周俊, 等. 《城市道路交通规划设计规范》(GB 50220-95)中有关指标合理性和取值研究[J]. 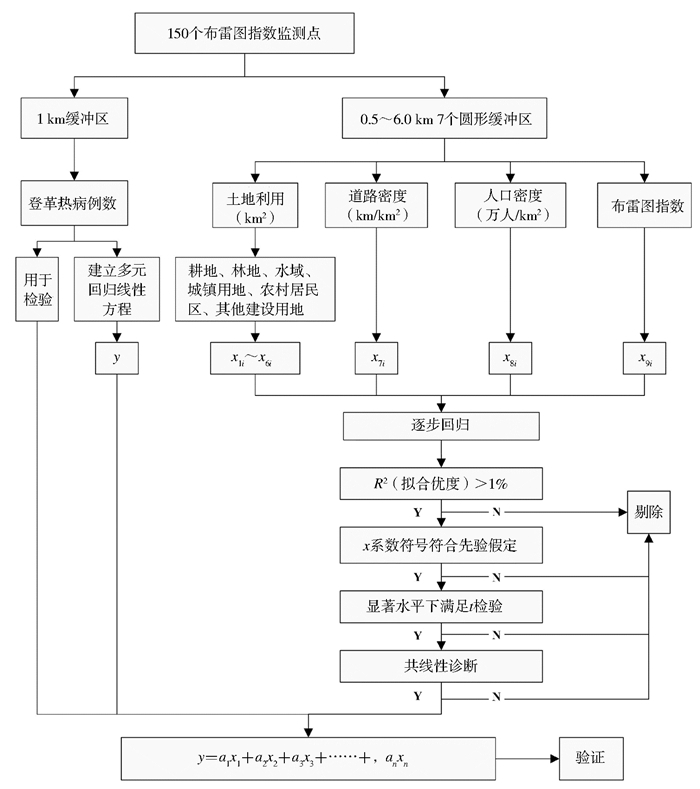 交通标准化, 2011(8): 18-20. 张钰娟, 薛凤霞, 白志鹏. 时间调整土地利用回归模型用于孕期空气污染暴露评估的研究进展[J]. 中华预防医学杂志, 2017, 51(3): 265-276. Becerra TA, Wilhelm M, Olsen J, et al. Ambient air pollution and autism in Los Angeles county, California[J]. Environ Health Perspect, 2013, 121(3): 380-386. 岳玉娟, 鲁亮, 刘起勇. 广州市蚊虫密度与土地覆盖类型关系研究[J]. 中国媒介生物学及控制杂志, 2016, 27(2): 99-102. 吴健生, 谢舞丹, 李嘉诚. 土地利用回归模型在大气污染时空分异研究中的应用[J]. 环境科学, 2016, 37(2): 413-419.